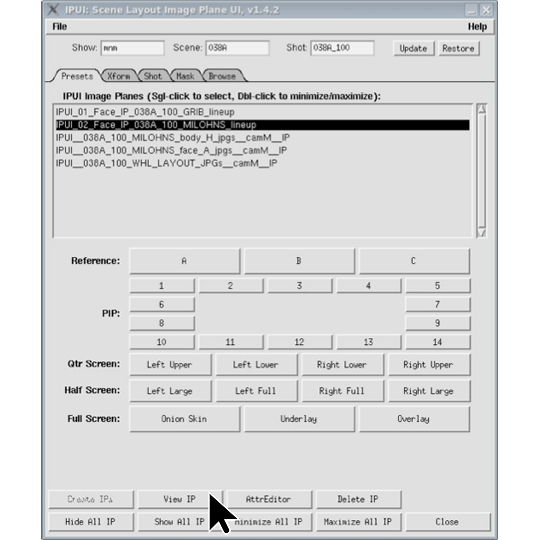 The tool in the images above was a Maya tool for my ImageMovers Digital Layout crew which gave us multiple image references within the camera view. With the tool we could make an onion skin of overlapping images, usually another department's work over ours, or just bring up the actor's reference video to compare against our performance. I named the tool IPUI, which stands for Image Plane User Interface. Check out the PDF file to read the user instructions for the tool, and if you'd like to check out the source code read this PDF file. Another tool I created for the same department was named the Scene Layout Toolbox. It wrapped up all of our scripts and functions into one master tool for ease of use for each artist. Check out the images below to see the user interface and some of the capabilities of the tool.